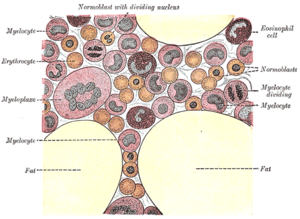 Gray's Anatomy illustration of cells in bone marrow. Bone marrow is the soft, flexible, vascular tissue found in the hollow interior cavities and cancellous bone spaces in the center of many bones and which is the source of erythrocytes (red blood cells) and leukocytes (white blood cells). There are two main types of bone marrow. Red bone marrow is the center of production of all blood cells except one type of lymphocyte, which matures in the thymus. Yellow bone marrow stores fats. As the source of blood cells, the bone marrow is critical to the health of people. The disruption of the intricate harmony, such as the production of too many, too few, or abnormal blood cells, results in diseases, such as leukemia, that can be life-threatening. Medical procedures have been developed to examine the bone marrow (bone marrow aspiration and biopsy) of patients and also to transfer normal stem cells from a donor into a recipient (bone marrow transplantation). 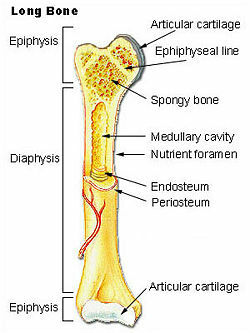 Illustration of a section through long bone, with spongy bone in its center. Bones are semi-rigid, porous, mineralized organs, consisting of cells in a hard matrix, that form part of the endoskeleton of vertebrates. Although externally bones may appear to be simple structures, in reality they are composed of living bone tissue interlaced with blood vessels, nerve fibers, and so forth. Light micrograph of cancellous bone, stained with hematoxylin and eosin, showing bone trabeculae (stained pink) and marrow tissue (stained blue). Bone is not a uniformly solid material, but rather has some spaces between its hard components. The hard outer layer of bones is called compact bone tissue due to its minimal gaps or spaces. Filling the interior of the organ are cavities and spongy bone tissue, which is comprised of a network of flat or needle-shaped trabeculae, which makes the overall organ lighter and allows room for blood vessels and bone marrow. Spongy bone accounts for about 20 percent of total bone mass in humans, but has nearly ten times the surface area of compact bone. Cancellous bone is a type of osseous tissue with a low density and strength but very high surface area, that fills the inner cavity of long bones. The external layer of cancellous bone contains red bone marrow where the production of blood cellular components takes place. Cancellous bone is also where most of the arteries and veins of bone organs are found. The bone marrow is located within the medullary cavity of long bones and the interstices of cancellous bone. Bone marrow is involved in the formation of both erythrocytes (red blood cells) and some leukocytes (white blood cells). The main categories of leukocytes are granulocytes (neutrophils, basophils, eosinophils), lymphocytes (B cells, T cells, natural killer cells), and monocytes (including macrophages). All of these types are produced and derived from a pluripotent cell—a cell that has the potential to differentiate into a variety of cells—in the bone marrow known as a hematopoietic stem cell. Mammalian stem cells differentiate into several kinds of blood cells within the bone marrow (Abbas and Lichtman 2003). This process is called hematopoiesis. However, not all leukocytes mature in the bone marrow. There are two main types of lymphocytes, T cells and B cells, and while B cells remain in the bone marrow to mature, T cells migrate to and mature in a distinct organ called the thymus. In addition to being a source of erythrocytes, aging red blood cells are broken down in the bone marrow, as well as in the spleen and liver. There is biologic compartmentalization in the bone marrow, in that certain cell types tend to aggregate in specific areas. For instance, erythrocytes, macrophages, and their precursors tend to gather around blood vessels, while granulocytes gather at the borders of the bone marrow. Section through the femur head, showing the cortex, the red bone marrow and a spot of yellow bone marrow. The white bar represents 1 centimeter. There are two types of bone marrow: red marrow (consisting mainly of myeloid tissue) and yellow marrow (consisting mainly of fat cells). Red blood cells, platelets, and most white blood cells arise in red marrow; some white blood cells develop in yellow marrow. Both types of bone marrow contain numerous blood vessels and capillaries. At birth, all bone marrow in children is red. With age, more and more of it is converted to the yellow type. 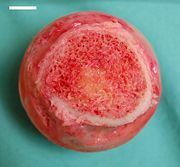 Red marrow is found mainly in the flat bones, such as the hip bone, breast bone, skull, ribs, vertebrae and shoulder blades, and in the cancellous ("spongy") material at the proximal ends of the long bones femur and humerus. Yellow marrow is found in the hollow interior of the middle portion of long bones. In cases of severe blood loss, the body can convert yellow marrow back to red marrow in order to increase blood cell production. The stroma of the bone marrow is all tissue that is not directly involved in the primary function of hematopoiesis. The yellow bone marrow belongs here, and makes the majority of the bone marrow stroma, in addition to stromal cells located in the red bone marrow. Still, the stroma is indirectly involved in hematopoiesis, since it provides the hematopoietic microenvironment that facilitates hematopoiesis by the parenchymal cells. For instance, they generate colony stimulating factors, affecting hematopoiesis. Macrophages contribute especially to red blood cell production. They deliver iron for hemoglobin-production. The blood vessels constitute a barrier, inhibiting immature blood cells from leaving the bone marrow. Only mature blood cells contain the membrane proteins required to attach to and pass the blood vessel endothelium. Hematopoietic stem cells may also cross the bone marrow barrier and may thus be harvested from blood. The bone marrow stroma contains mesenchymal stem cells (also called marrow stromal cells). These cells are multipotent stem cells that can differentiate into a variety of cell types. 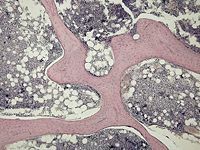 Cell types that mesenchymal stem cells have been shown to differentiate into in vitro or in vivo include osteoblasts, chondrocytes, myocytes, adipocytes, and, as described lately, beta-pancreatic islets cells. They can also transdifferentiate into neuronal cells. Hematopoietic stem cells give rise to the three classes of blood cells that are found in the circulation: white blood cells (leukocytes), red blood cells (erythrocytes), and platelets (thrombocytes). Mesenchymal stem cells are found arrayed around the central sinus in the bone marrow. They have the capability to differentiate into osteoblasts, chondrocytes, myocytes, and many other types of cells. They also function as "gatekeeper" cells of the bone marrow. There are various diseases that are tied to the bone marrow, such as leukemia and multiple myeloma. 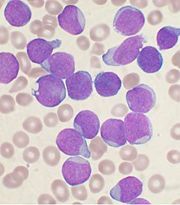 Leukemia is a cancer of the blood or bone marrow and is characterized by an abnormal proliferation (production by multiplication) of blood cells, usually white blood cells (leukocytes). Leukemia is a broad term covering a spectrum of diseases. Multiple myeloma (also known as MM, myeloma, plasma cell myeloma, or Kahler's disease) is a type of cancer of plasma cells, which are immune system cells in bone marrow that produce antibodies. The normal bone marrow architecture can be displaced by malignancies or infections such as tuberculosis, leading to a decrease in the production of blood cells and blood platelets. In addition, cancers of the hematologic progenitor cells in the bone marrow can arise; these are the leukemias. A Wright's stained bone marrow aspirate smear from a patient with leukemia. To diagnose diseases involving the bone marrow, a bone marrow aspiration is sometimes performed. A bone marrow aspiration is the removal of fluid from the spongy material of bones by suction (Haggerty 2002). It is also known as bone marrow sampling. A bone marrow biopsy is the removal of a small piece of bone marrow, and also is known as needle biopsy (Haggerty 2002). This typically involves using a hollow needle to acquire a sample of red bone marrow from the crest of the ilium under general or local anesthesia. Bone marrow aspiration may be used to pinpoint the reason for an abnormal blood test result, confirm a diagnosis, or diagnose infection; bone marrow biopsy may be used to diagnosis some types of cancer or anemia, identify source of unexplained fever, and diagnosis myeloma when bone marrow aspiration has failed to provide adequate specimen (Haggerty 2002). Bone marrow examination is the pathologic analysis of samples of bone marrow obtained by bone marrow biopsy and bone marrow aspiration. Bone marrow examination is used in the diagnosis of a number of conditions, including leukemia, multiple myeloma, anemia, and pancytopenia. The bone marrow produces the cellular elements of the blood, including platelets, red blood cells, and white blood cells. While much information can be gleaned by testing the blood itself (drawn from a vein by phlebotomy), it is sometimes necessary to examine the source of the blood cells in the bone marrow to obtain more information on hematopoiesis; this is the role of bone marrow aspiration and biopsy. Blood cells need to be constantly replaced, but sometimes, due to disease or other conditions, stem cells may produce abnormal amounts of blood cells. Exposure to radiation or chemotherapy will kill many of the rapidly dividing cells of the bone marrow and will therefore result in a depressed immune system. Many of the symptoms of radiation sickness are due to damage to the bone marrow cells. However, it is possible to take hematopoietic stem cells from one person and then infuse them into another person (allogenic) or into the same person at a later time (autologous). If donor and recipient are compatible, these infused cells will then travel to the bone marrow and initiate blood cell production. Bone marrow transplantation is the name for the process involving extracting bone marrow containing normal stem cells from a healthy donor and infusing them into someone whose body cannot manufacture proper quantities of normal blood cells (Barrett and Ruth 2002). Transplantation from one person to another is performed in severe cases of disease of the bone marrow. In addition, some medical therapies, such as chemotherapy or radiation treatment, may destroy stem cells. In bone marrow transplantation, the recipient's marrow is first killed off with drugs or radiation, and then the new stem cells are introduced. Before radiation therapy or chemotherapy in cases of cancer, some of the patient's hematopoietic stem cells are sometimes harvested and later infused back when the therapy is finished to restore the immune system. The stem cells are harvested from the donor directly from the red marrow in the crest of the ilium, usually under general anesthesia. Contrary to popular belief, discomfort is usually minimal and the donor may remain at the hospital only for 24 to 48 hours and soon resume normal activities (Barrett and Ruth 2002). Another option is to administer certain drugs that stimulate the release of stem cells from the bone marrow into circulating blood. 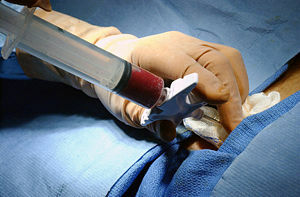 An IV is inserted into the donor's arm, and the stem cells are filtered out of the blood. The procedure is similar to donating blood or platelets. It may also be taken from the sternum. The tibia may seem a good source, since it is very superficial. However, except in children, this bone marrow does not contain any substantial amount of red bone marrow, but rather only yellow bone marrow. In newborns, stem cells may be retrieved from the umbilical cord. The bone marrow is transferred to the recipient via a catheter inserted into a vein in the chest (Barrett and Ruth 2002). There is a waiting period of from two to four weeks to see if the transplant is a success, with the patient kept isolated to protect against possible infections (Barrett and Ruth 2002). This is a risky procedure. Approximately thirty percent of people receiving allogeneic transplants do not survive; on the other hand, about ninety percent of autologous transplants survive (Barrett and Ruth 2002). Though once used in various preparations, including pemmican, bone marrow for human consumption in America has recently fallen out of favor as a food. Now, it is commonly used only as a flavoring for soups and sauces, although dishes with intact bone marrow can still be found in some European restaurants. Bone marrow is a source of protein and high in monounsaturated fats. These fats are known to decrease LDL cholesterol levels resulting in a decreased risk of cardiovascular disease, prompting some to make bone marrow a dietary staple. The actual health effects of the addition of bone marrow to the diet remain unclear. Abbas, A. K., and A. H. Lichtman. 2003. Cellular and Molecular Immunology, 5th ed. Philadelphia: Saunders. ISBN 0721600085. Barrett, J. and L. Ruth. 2002. Bone Marrow transplantation. Pages 550 to 555 in J. Longe, The Gale Encyclopedia of Medicine, 2nd edition. ISBN 0787654892. Haggerty, M. 2002. Bone marrow aspiration and biopsy. Pages 547 to 550 in J. Longe, The Gale Encyclopedia of Medicine, 2nd edition. ISBN 0787654892. Rubin, R., D. S. Strayer, and E. Rubin. 2007. Rubin's Pathology: Clinicopathologic Foundations of Medicine. Philadelphia: Lippincott Williams & Wilkins. ISBN 0781795168. This page was last modified on 13 August 2008, at 16:08.